The Quickplay Kickster Academy FA Size Football Goal 12ft x 6ft is the FA size for junior football (ages 12 and under). Forget the frustration of filling up the whole back seat of the car with one goal. This is a truly portable goal, which can be used anywhere - in the garden, park, playground, beach or wherever. All poles are pre-attached with elastic cord (just like a tent!). Quick attach net save system. Making it easy for anyone to assemble and reduces lost parts. Complete with durable, easy open carry bag with shoulder strap. Assembled size - L 366cm x H 183cm x D 100cm (12' x 6'). Packed size - 110cm x 15cm x 15cm. Please note these goals are sold individually. Brilliant product, it's quick and easy to assemble (takes around 2/3 mins) and can withstand some powerful shots. Ideal for the garden but also taking over the park, it's worth every penny! The service and delivery speed with Newitts was also very good. This product is exactly as described and just what I was looking for. Delivery was within a few days. Product is easy to assemble literally takes a couple of minutes and packs away easily too. Light enough to carry from the car to the pitch. Bought this for my 7 year old birthday. Goes up so easily and down again which is ideal for our communal garden. Has been used in really windy weather and stayed stable thanks to the included ground pegs. Couldn't be happier! Excellent product, easy to assemble & pack away for my son to take the park. Highly recommended. Will be buying from Newitts again. Absolutely over the moon with this product. It really does assemble in just a couple of minutes and the quality and sturdiness really is impressive. Will be purchasing for our grassroots team as well as form home! With all the posts down for summer and teams moving to the 16 foot v 7 foot sized posts we very keen to start practising moves using the new size posts. The Kickster has proved invaluable, easy ton assemble and sturdy. I bought this for my U7's team, they are easily set up within 5mins by one adult. The carry bags are a little on the small side when packing away, other than that early days - but good value for money. Well designed product. Relatively easy to assemble. Made to last. The goals are excellent!!! They are prefect for our football training and match sessions. 10/10 +A and the service was top class. My grandson loves it . I bought these goals for our U6 players, having previously bought a set for the U7's based on the reviews I had read and I can honestly say that they have not disappointed! They are incredibly easy to put up (although as some have already mentioned 2 minutes may be pushing it!) and can withstand the hardest of shots even from the coaches, with the most satisfying thing for me being the way the ball bounces back off the net when you have curled one into the top corner, rather than getting caught at the back of the goal leaving the goalkeeper trying to retrieve the ball like a fisherman trying to pick a crab out of his net. They have also brought admiring glances from most other coaches at the club so there is every likelihood that there could be more orders on the way. I have no hesitation in giving these 5 stars. Best Buy ever for football. Use with my boys up the field and also for my grassroots team. Strong, quick to set up. Bought a second as so pleased with first and now get pickup games going on widen I set up for my boys. Very pleased with this purchase. It is as fast as advertised to put up and take down in addition to being strong and durable. Best price I found was on newitts. Really good product. five mins to assemble. May get quicker when i get used to it. stops shots from adults too. so great design. Excellent product. Really quick to assemble and take down. It has been used in weekly football training sessions for a u13's team and it has stood up really well. Would definitely recommend. 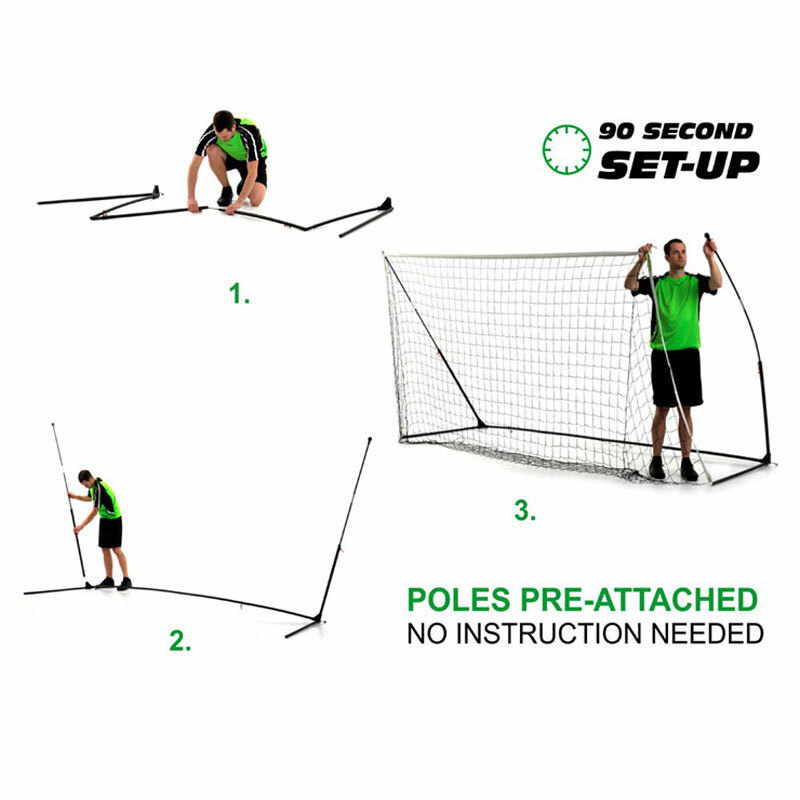 very sturdy goal, easy to put up and take down.packs away neatly in its own bag,the net is better than most other goals Excellent product for the money. 5 out of 5 Grandchildren love it!! What a great product! Xmas present for our 2 grandsons - first one to be opened and taken straight out, erected and used - very easy to erect and dismantle for our 10 and 12 year olds. They love it!! Bought this for my 9 and 6 year old boys (and me...). and it did not disappoint. Quick to set up and take down (3-5m) and withstands my hardest shots. Suspect will have a few years of life if taken care of, but well designed and very sturdy. If you want more than a pile of coats don't spend a little less, get this you'll be very happy you did. PS I am v tall so find set up n folding net quite easy. Very good quality and very pleased with the product, easy to put up and take down, well worth the money. Surprisingly sturdy once assembled. Use for our U10 Football training sessions, brilliant goal, stable (when pegged to ground) and strong. Once you get used to assembly, only takes 5mins. 5 out of 5 Great goal! My 10 year old decided to buy this with his birthday money and he's glad he did. It's really quick to put up and take down. Brilliant that you can take it with you to the park/granny's house as we did today. My husband wasn't with us and I managed to carry it and set it up no problem at all. Great goal for ease of assembly and compact storage. Have used many and they are sturdy. Also want to praise Newitts and Quickplay for supplying replacement bags, and parts so efficiently and without any hassle.. Excellent goal. would advise buying the quickplay sandbags or buying some weights for indoor use. Perfect pegged down in the grass though. We've had all sorts of goals in the past (except Samba) and sooner or later they've all fallen apart. The Kickster is fantastic ... it absorbs the impact of a full size ball kicked with force with absolutely no problem. Really easy to erect and very portable unlike all the other goals we've had. The only two drawbacks, which are very minor, are (a) the netting is easily tangled unless you come up with a system for putting away carefully, and (b) I don't know how long the netting will last ... it's absolutely fine so far after a month or so, I'm just a bit worried that it might become frayed ... but maybe that's just me being paranoid. On balance the price is fairly high but well worth it. Delivery was really quick. 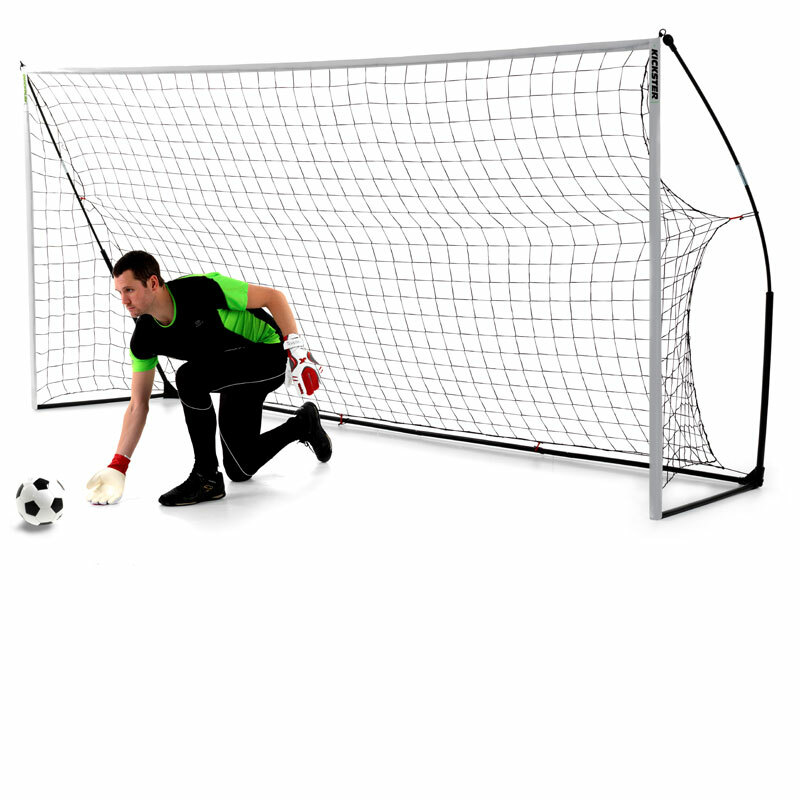 Bought one of these goals after reading recommendations for shooting practice for our Girls U12 training sessions. Very impressed, as others describe, quick and easy to erect and take down. Just have to be careful when packing away the net to make sure it doesn't get tangled, otherwise takes longer than the 2 mins to erect again!. So impressed we have now purchased a 2nd goal to use at our training games at the end of each session. This product has been excellent for training my U8/9's team. The goals are quick and easy to set up. They are strong and flexible and can handle powerful shots with ease. Great piece of kit - light weight and easy set up. The only reason not a 5 star is that the netting can get tangled during set up. 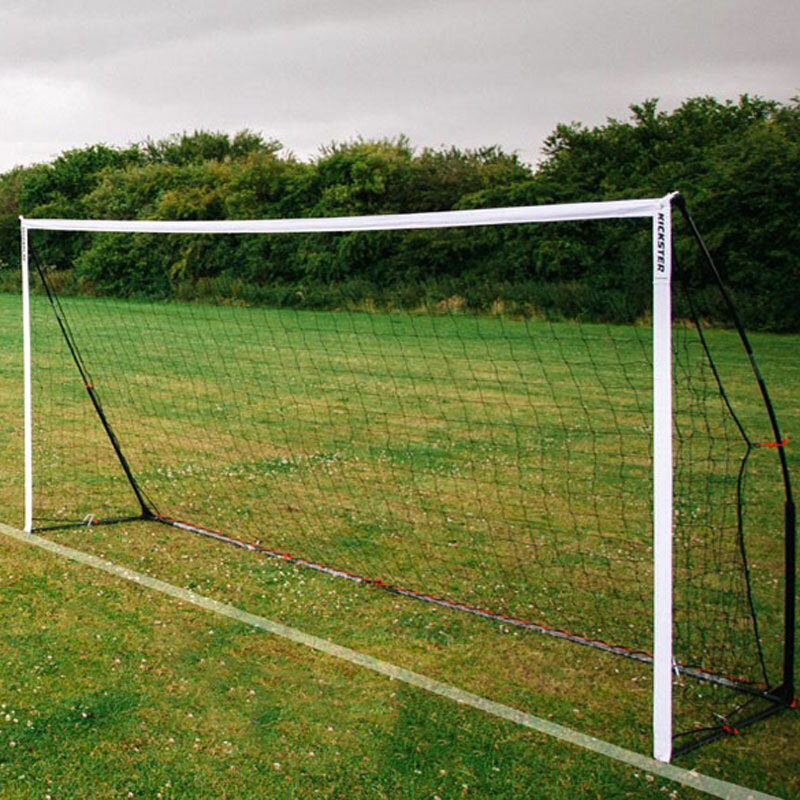 great item ,assembled in minutes, used for under 10 football team for training, slightly different net securing system to upright poles as shown in picture (not velcro )but elastic cord and "S" type net hook a bit more time consuming to hook to nets, but all in all well pleased and so are the boys in the team. Just one word "Excellent" I bought these for my under 10s side and they are perfect for our training sessions. Easy to put up and put away. Great buy. OUR U10s PLAYERS AND MANAGERS SAID GREAT PRODUCT, DOES WHAT IT SAYS ON THE BOX 2 MINUTE SET UP, ALSO VERY HAPPY WITH PRICE. I bought these goals to use for training for an U9's team. They are perfect; quick to set up and suprisingly robust. Exactly what I wanted, no mor wasting valuable time setting up Sanba goals but just as effective. Did I mention Newitts' service - very fast delivery, great price and good communication. This is my second purchase of a kickster one for the garden, I already have two for my U11 football team. It's straightforward to put up and strong much better than other goals I've used which have bent or shattered as it can take some rough treatment and springs back into shape. Brought the goals for my U10's football team to practice with at training. They are easy to set up, sturdy and great value for money. Delivery of product was very prompt and I would both recommend and use Newitts services again. 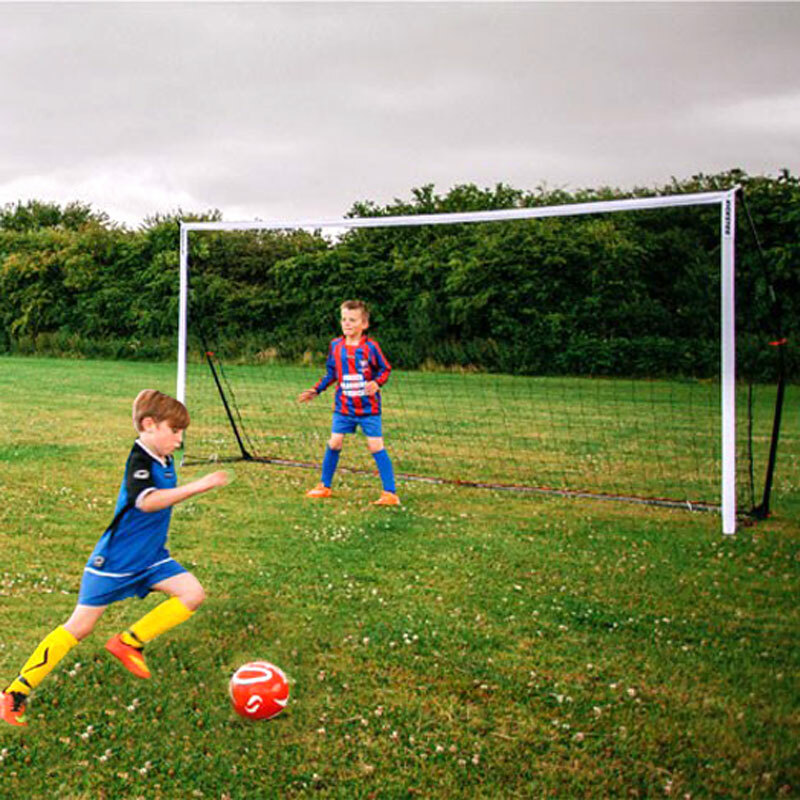 I purchased the Kickster Academy Portable Football Goal for my grandson's 10th birthday and he thinks it is brilliant. It is the same size that is used when he plays for his football team and so is ideal for practising his shooting skills. His father thought it was great too as he could put the goal up in 5 minutes for his son. A great buy. 5 out of 5 Fantastic Product! I bought this for my football crazy sons, aged 13,10 & 9...... they can put it up themselves and it is strong enough for their hardest shot at goal! Not the cheapest portable goal on the market but worth every penny ..... the saying "you get what you pay for" certainly applies to this goalpost. Highly Recommend!!! 5 out of 5 These goals are excellent! After a couple of practice attempts, these goals really can be set-up by one person in just a couple of minutes. Perfect for setting up for training, and light enough that two can be carried comfortably from the car boot to the training venue. Add to this the fantastic price from Newitts, and these goals are an almost essential part of a youth football team's training kit! Very Easy to transport (carryable with strap) ridiculously easy to set up (now takes us roughly one minute) Only slight negatives are the crossbar is fabric and droops in the middle, and the goal is too expensive. other than that a great portable goal. I coach an U10 team and teh kickster goals has allowed us to raise the level of coaching session increase the fun the boys have and also increasing the standard of work we can achieve. Have already had hours of use from this goal .It does however go up in 5 mins not 2 . Good piece of kit for the lad and his team who borrow it saturdays. I have 2 pairs of 12x6 and 2 pairs of 6x4 kickster goals. What is great about them is how esy they are to set up and carry, I can carry 4 12x6 goals on my shoulders. The goals are reasonably sturdy and will take a powerful shot without falling over. There are a couple of issues however. The poles have an elasticated cable that runs through them, that has now broken on 2 goals I own.